Competitive inhibitors bind reversible to the enzyme, preventing the binding of substrate. On the other hand, binding of the substrate prevent the binding of the inhibitor. Substrate and inhibitor compete for the enzyme. 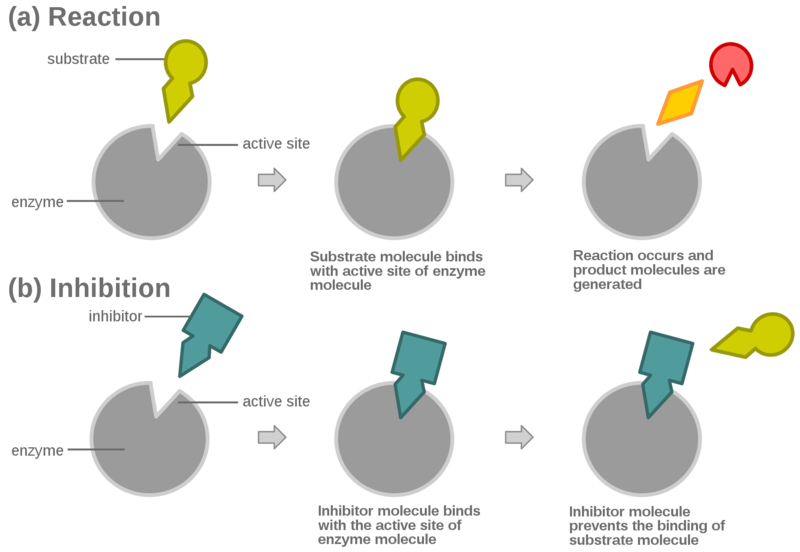 In competitive inhibition, the inhibitor and the substrate compete for the enzyme (i.e., they cannot not bind at the same time). Often competitive inhibitors strongly resemble the real substrate of the enzyme. For example, methotrexate is competitive inhibitor of the enzyme dihydrofolate reductase, which catalyzes the reduction of dihydrofolate to tetrahydrofolate. There is a similarity between the structures of folic acid and this drug. In some cases, the inhibitor can bind to a site other than the binding site of the usual substrate and exert an allosteric effect to change the shape of the usual binding site. For example, strychnine acts as an allosteric inhibitor of the glycine receptor in the mammalian spinal cord and brain stem. Glycine is the major post-synaptic inhibitor neurotransmitter with a specific receptor for glycine, resulting in convulsions due to lessened inhibition by the glycine. In competitive inhibition, the maximum rate of the reaction in not changed, but higher substrate concentrations are required to reach a given maximum rate, increasing the apparent Km. In uncompetitive Inhibition, the inhibitor cannot bind to the free enzyme, only to the ES-complex. The ES-complex thus formed is enzymatically inactive. This type of inhibition is rare, but may occur in multimeric enzymes. Non-competitive Inhibitors can bind to the enzyme at the binding site at the same time as the substrate, but not to the active site. Both the EI and EIS complexes are enzymatically inactive. Because the inhibitor cannot be driven from the enzyme by higher substrate concentration (in contrast to competitive Inhibition), the apparent Vmax changes. But because the substrate can still bind to the enzymes, the Kmax stays the same. This type of inhibition resembles the non-competitive Inhibition, except that the ES-complex has residual enzymatic activity. This type of inhibitor does not follow Michaelis-Menten equation. In many organisms, inhibitors may act as part of feedback mechanism. If an enzyme produces too much of one substrate in the organism, that substance may act as an inhibitor for the enzyme at the beginning of the pathway that produces it, causing production of the substance to slow down or stop when there is sufficient amount. This a form of negative feedback. Enzymes that subject to this form of regulation are often multimeric and have allosteric binding sites for regulatory substances. Their substrate/velocity plots are not hyperbolar, but sigmoidal (S-shaped). The coenzyme folic acid and anti-cancer drug methotrexate are very similar in structure. As a result, methotrexate is a competitive inhibitor of many enzymes that uses folates. Irreversible inhibitor reacts with the enzyme and form a covalent adduct with the protein. The inactivation is irreversible. These compounds include eflornithine a drug used to treat the parasitic disease sleeping sickness. Penicillin and Aspirin also act in this manner. With these drugs, the compound is bound in the active site and the enzyme then converts the inhibitor into an activated form that reacts irreversibly with one or more amino acid residues. Since inhibitors modulate the function of enzymes they often are used as drugs. A common example of an inhibitor that is used as a drug is aspirin, which inhibits the COX-1 and COX-2 enzymes that produce the inflammation messenger prostaglandin, thus suppressing pain and inflammation. However, other enzyme inhibitors are poisons. For example, the poison cyanide is an irreversible enzyme inhibitor that combines with the copper and iron in the active site of the enzyme cytochrome c oxidase and blocks cellular respiration.